When I was a young manager, early in my career, I remember having a conversation with a fellow employee who was upset about a change in procedure from the top. She came to me in confidence and, after I listened to what she had to say, I tried to help. I remember telling her that she needed to separate her emotions from the equation, that business was business and – this part I remember quite vividly – that a Company is a Company. It’s not a person. It has no emotional intent or motivation, and that if she realized that then she would be able to see the logic behind Upper Management’s decision, etc. I thought it was good advice. And maybe it was ten years ago. Back then, the book du jour was The 48 Laws of Power by Robert Greene. It was a different time… Just after the dot-com hullabaloo. Social media was in its infancy. The world was riding high; business and home values on the rise. What a ride it was then. Fast, hard driving, me, me, me. I see things very differently today. Great things are happening at work; we are on the precipice of a fantastic new chapter in our future. And yet this afternoon, I found myself wrestling with some significant business choices. So, I went to my mentor for advice and guidance. (If you don’t have a business mentor, get one tomorrow. Run! It will be one of the most significant investments you will ever make in yourself and in your future.) And as I walked through it with my mentor, out of nowhere, I felt a huge swell of emotion – one that was hard to contain. I finished the conversation, sucking it up and telling myself that “no one cries in baseball.” I am still unsettled. And as I work through it (which will take some time), I thought of that advice from so long ago… And thought about what I would say to that teammate today. Yes, business is business. But business is a combination of the head and the heart. I am farther along in my career, and today I am one of the people making those decisions that are lasting… which have meaning to lives beyond my own. I have a responsibility to those lives… to those people. I’m invested in them. I know them, know their dreams, know their fears and I share their sorrows. They are teammates, employees, friends and more often than I would admit, they are family. We don’t just work together; we have real relationships. It’s a heck of a lot harder carrying the weight of all of those hearts. But I am a better manager today because I carry that load. Business is about emotions, and to be successful today, you have to connect emotionally to those you serve. Tonight, as I worked though all of these conflicted emotions, I looked up at the core values posted on my wall. We all have them at our offices (and hopefully memorized), but do you have them at home? 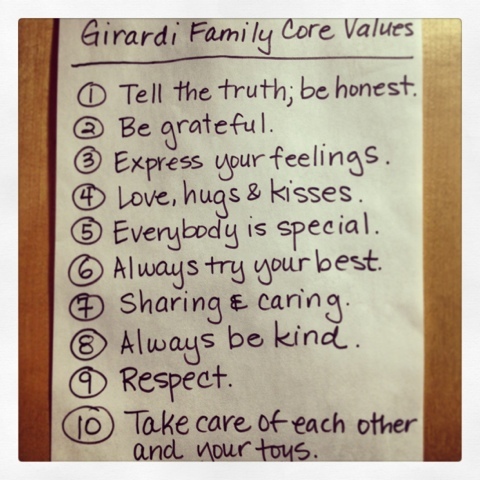 My son and I defined our Family Core Values when he was 3. And looking at them today, they’re pretty good. It’s a mantra at home with buy in from the boys. Tonight, I think they are pretty good for work too. They’re emotionally based. So is work. Business is just a collection of people after all. And people are pretty special. Tags: Business, Emotion, Leadership, Responsibility, Self-awareness, Senior management, Values | Permalink.